Associated Press/Virginia Mayo; Nicolas Asfouri – Pool/GettySaudi Crown Prince Mohammed bin Salman, pictured at right, reportedly doesn’t get why Jamal Khashoggi’s disappearance has turned into such a big diplomatic crisis. Riyadh on Friday for the first time acknowledged Khashoggi’s death. 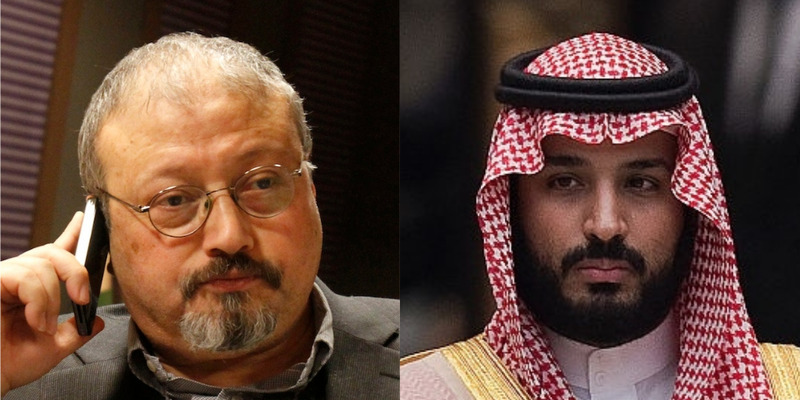 Saudi Crown Prince Mohammed bin Salman is suspected of being behind the death of the Saudi journalist Jamal Khashoggi. Saudi Arabia has denied this, and its latest account of Khashoggi’s death says the killers went behind the prince’s back. The crown prince was shocked to see that Khashoggi’s disappearance provoked such international outrage, and he asked White House adviser Jared Kushner why it was happening, The Wall Street Journal reported over the weekend. Crown Prince Mohammed also grew angry that Khashoggi’s disappearance turned into such a big diplomatic crisis, The Journal said. Saudi Arabia’s crown prince, the man suspected of ordering the killing of Jamal Khashoggi, could not understand why the Saudi journalist’s disappearance was such a big deal, The Wall Street Journal reported. Mohammed bin Salman was shocked to see Khashoggi’s disappearance in the Saudi Consulate in Istanbul provoke such international outrage, and he called the White House adviser Jared Kushner to ask why, the paper said. Citing unnamed people who recently interacted with the prince, The Journal said Crown Prince Mohammed became angry that the episode had turned into a diplomatic crisis. Business leaders and politicians, are now shunning Saudi Arabia, with everyone from the US Treasury secretary to The New York Times pulling out of a major conference in Riyadh scheduled to take place Tuesday. Crown Prince Mohammed called Kushner, President Donald Trump’s son-in-law and Middle East adviser, on October 10, The Journal said, eight days after Khashoggi disappeared. Crown Prince Mohammed asked in English what the outrage was about, the report said, citing two people who were briefed on the conversation. Kushner and John Bolton, the US national security adviser, reportedly told the crown prince in response that he had to solve the crisis quickly. Kushner is close to Crown Prince Mohammed and – according to CNN – texts him directly sometimes on WhatsApp. He has not taken a public role in the US response to the Khashoggi crisis, but reports suggest he has advised Trump to stand by Saudi Arabia until the episode blows over. Part of the reason the Khashoggi episode turned into a major diplomatic crisis was the sheer depravity of the reports of his killing, which included leaks that agents brought a bone saw into the Saudi Consulate and dismembered the journalist. Khashoggi, a 59-year-old contributor for The Washington Post, also had powerful friends in Washington. The Saudi royal family, which runs the country, was initially “relaxed” about Khashoggi’s disappearance when reports first emerged, The Journal reported, citing a source close to the royal household. The Trump administration appeared reluctant to hold the Saudi leadership responsible for weeks after Khashoggi’s disappearance. Trump has continued to tout billions of dollars’ worth of arms contracts struck between Washington and Riyadh, which he has repeatedly claimed could create hundreds of thousands of jobs in the US. After Saudi Arabia acknowledged Khashoggi’s death, Trump told The Post that “obviously there’s been deception, and there’s been lies” in the Saudi explanation of the disappearance and death. But the president said he “would love if he wasn’t responsible,” referring to Crown Prince Mohammed. Many of the 15 men identified in the Turkish news media as suspects in Khashoggi’s killing have been seen in the crown prince’s entourage. Riyadh first acknowledged Khashoggi’s death on Friday night – 17 days after he disappeared – but attributed it to “a quarrel and a physical confrontation” that got out of hand. Saudi officials, including Crown Prince Mohammed, previously claimed that Khashoggi left the consulate and denied knowing his whereabouts. The kingdom appears keen to distance the crown prince from the matter. Shortly after acknowledging Khashoggi’s death, Saudi Arabia detained 18 suspects and dismissed a high-ranking general – most likely an attempt to portray the killing as a rogue operation, rather than one sanctioned by the upper echelons of the Saudi government. The Saudi foreign minister, Adel Al-Jubeir, has said Crown Prince Mohammed “was not aware of” the operation that resulted in Khashoggi’s death. The crown prince has been given powers to restructure the country’s intelligence services, the state-run Saudi Press Agency reported Friday. Turkish President Recep Tayyip Erdogan promised that he would reveal the “naked truth” about Khashoggi’s death on Tuesday. Find all of INSIDER’s coverage of the disappearance of Saudi journalist Jamal Khashoggi here.